I've developed a way to paint leather fairly quick and with pretty good results. 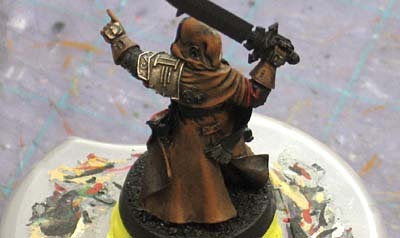 I started using this method to paint the pouches and such on Space Marine Scouts, so when it came time to paint Inquisitor Lok's leather coat, I figured why not give it a go on a larger area. If it works for small things, it should work for big things right? Well, it does, I just needed to tweak it a little bit for this model. It doesn't take much along the lines of paint either. A light base color, two washes (Devlan Mud and Gryphonne Sepia) and a highlight color. What's wierd is that the "highlight" color is actually darker than the "base" color. The base color is really the most important part. Make sure your paint is smooth and you've got a nice, consistent finish before moving on. Any imperfections at this point will show up as you move on. 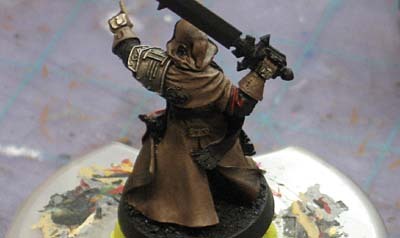 By using the light base color, you allow the washes to build up the shadows in the recessed areas. Next is the washes. It's usually 2 washes of Devlan Mud followed by a final wash of Sepia. In this case, I went with three washes of the Devlan before finishing with the Sepia because I wanted it to be fairly dark. 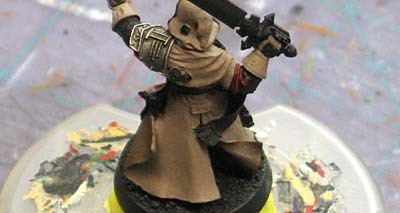 There are lots of open, smooth areas on his cloak as opposed to just a pouch where the detail is already there and much smaller. And last is the highlight. It's just a shade lighter than the final washed base color so I do some layering on the edges and that's all it takes. This is just one highlight, I went back in with a slightly lighter brown and added a second highlight to really make the folds pop and draw attention to certain areas. All in all, it's a quick process and you'll spend more time waiting for your washes to dry between each application than you will painting. I really wish you'd posted this a week ago, Ron, before I crudded up a bunch of SM Scouts. Still, good stuff for the future. Nice work Ron, I really like how that turned out. Anon: That's my fault. The shoulderpad is silver, the pic is off just enough to make it look gold. John: Sorry about that, I've got so much to post... I try to keep it to one thing a day. Sgt. Brisbane: The metal is just as easy. I'll see what I can get posted in the coming week. It's really is easier than the leather. does this work with a red or blue light base. and what was your light base color? was it from GW? Anon: You could try something similar with a different color base. The idea would certainly carry over. You'd have to adjust your wash colors and such though. As for the base color here, it's the Mississippi Mud color by Americana seen in the picture above that I start out with. With this technique, the base color actually starts out a lighter shade than your highlight color... it's the washes that make it dark though. I have to say my biggest complaint about your guide/tuts is the lack of color description. 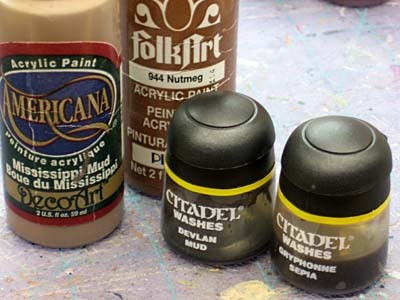 Post the paint colours you are using at a minimum and throw in suitable substitutes if you really want to help your readers out.